…it didn’t happen. See, I found myself with an unexpected morning off this week. And it just happened to be in the middle of a massive snow storm. And I had to shovel. That’s hard work, you know. You’ve really got to keep your strength up if you’re going to be shoveling lots of heavy, wet snow. So the butter came out to soften and my holiday baking was underway. 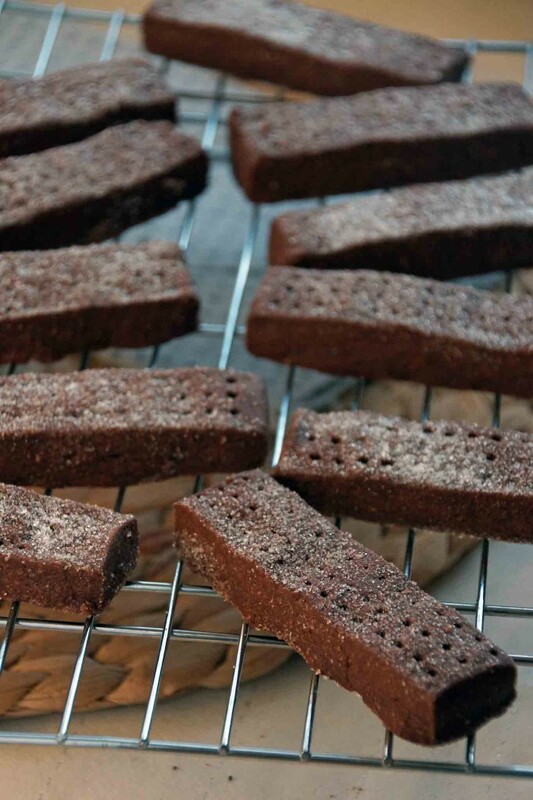 I started with these spiced chocolate shortbread fingers. 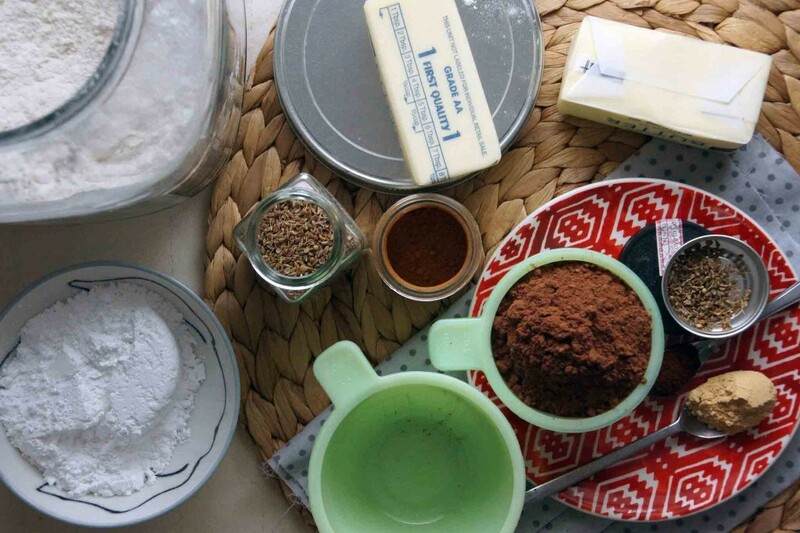 They are the perfect cookie to bake when you’re snowed in, relying on just a few staple ingredients you can almost always count on having on hand: butter, flour, cocoa, sugar ‘n spice. 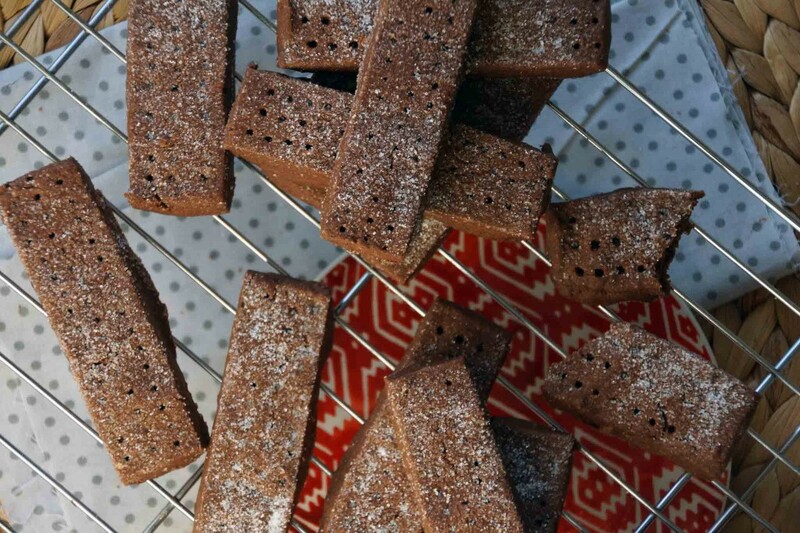 The flavor of the shortbread actually intensifies after sitting for a few days, making them an excellent treat for gifting. Plus, waiting for them to age to perfection buys me some more salad time. It all makes perfect sense, right? Right. Okay, let’s bake! Get the butter out to soften, then assemble the rest of the arsenal. We need flour, powdered sugar, a little salt, cocoa powder, and lots of spices. I’m using ginger, cinnamon, anise seeds, and clove to bring warmth and complexity to the chocolate. 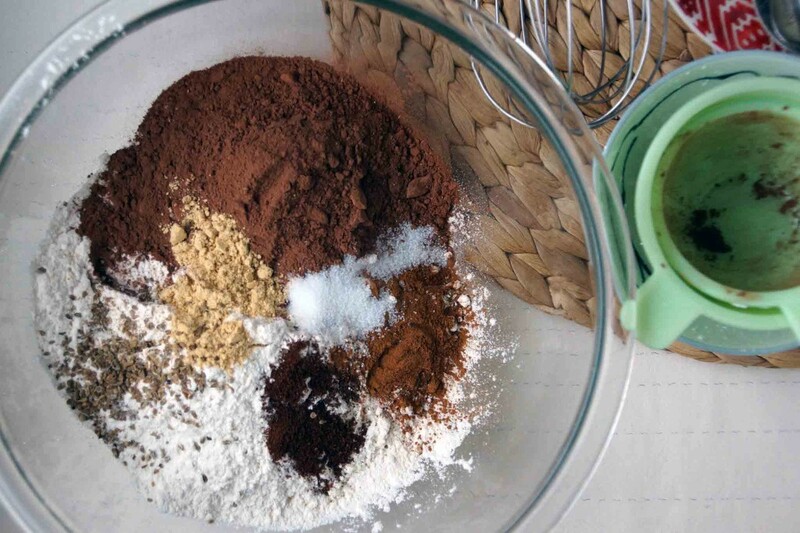 Whisk together the flour, spices, salt, and cocoa powder; cream the butter and powdered sugar. Combine the 2 and mix until clumps of dough form. 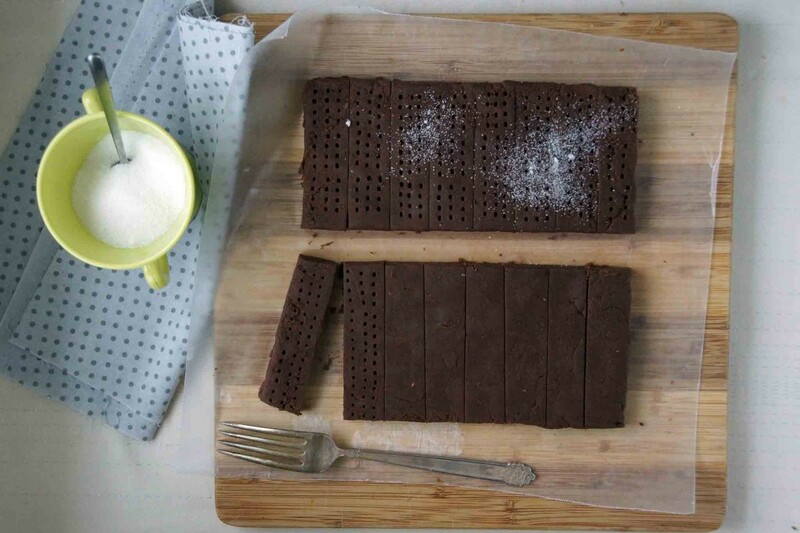 Dump the dough out onto a cutting board and press it into a square. Chill it for half an hour so it’ll be easier to cut and separate. After chilling, cut the dough square in half, then cut each half into slim fingers. Prick them with the tines of a fork and sprinkle with sugar and pop them in the oven. Bake and cool. Make sure to break at least 1 cookie before you think of making treat bags for your family and friends. It’s called quality-control. It’s also called salads can wait for January because this holiday baking game is on! These cookies hold up well and actually improve in flavor a day or 2 after baking, making them perfect for gift-giving! 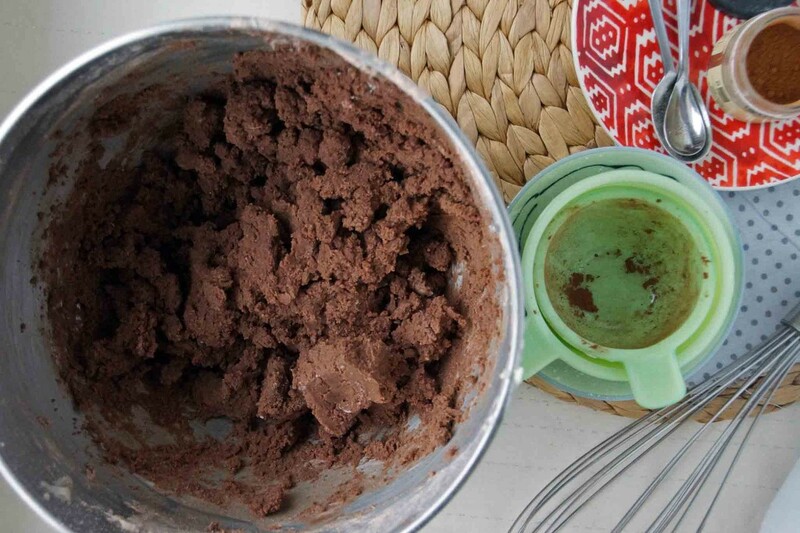 In a medium bowl, whisk together flour, cocoa powder, salt, and spices. In a separate bowl, cream together the butter and powdered sugar until light and fluffy. 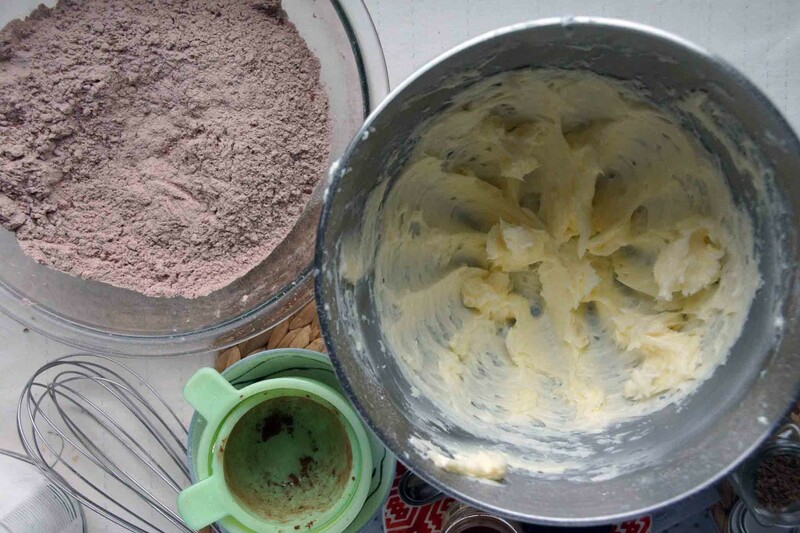 Add the flour mixture to the creamed butter and mix at medium speed until large clumps of dough form. Scrape the dough out of the bowl and onto a waxed paper or parchment-lined board. Using your hands and the side of a chef's knife or ruler, pat the dough into an even square, about 8 in. by 8 in. Refrigerate for 30 minutes. After the dough has chilled, preheat the oven to 300° and line a baking sheet with parchment paper. To form the shortbread "fingers", cut the square of dough in half, then cut each half into 8, 1-in. wide, rectangles. You could certainly cut the cookies in smaller rectangles or squares, if you prefer, and shorten the baking time slightly. Prick the tops of the cookies with the tines of a fork and sprinkle with the granulated sugar. Place on the prepared baking sheet and bake until the cookies are set, about 25 minutes. Allow to cool on the pan for 5 minutes, then transfer to a wire rack and cool completely. 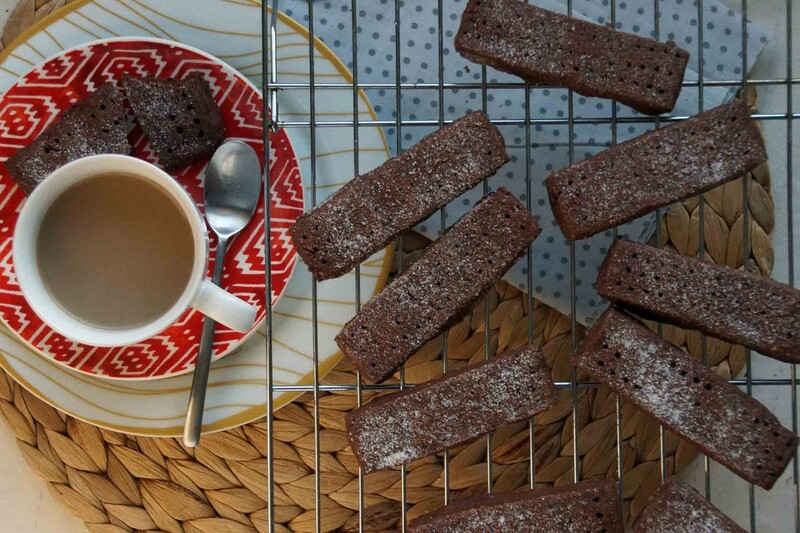 Perfect warming holiday treat! Should they be eaten within a few days after that 2 day period? Thank you! Thanks to all the butter, shortbread holds up well for a week or more. You could also freeze the unbaked cookies and bake them off when you’re ready–I haven’t tried it with this particular recipe, but usually shortbread dough can be frozen without issues. Hope you enjoy the cookies!